‘Female genital mutilation’ is widely condemned, yet the phrase—as well as the narrative of ‘dark Africa’ that it reflects—undermines efforts to reduce rates of cutting. 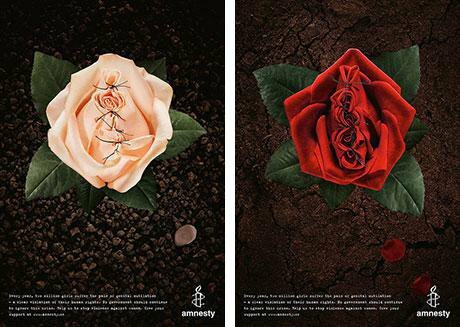 Anti-FGM posters from Amnesty International. Layalk/Flickr. Creative Commons. Let’s consider the judge’s logic carefully. First, by contrasting the “court” (by which he means America)with “traditional cultures”, the judge is contrasting us (America) with a them (Nigeria). He’s implying that only places like Nigeria are traditional—a euphemism for states seen as backward, regressive, and uncivilised—while the US is modern, a state conflated with progressiveness and enlightenment. I’ve published extensively on the ways in which Americans talk about the female genital cutting practices (FGCs) that are common in parts of Africa and elsewhere, focusing on the different ways opposition can be articulated and the consequence of those choices. There are many grounds upon which to oppose FGCs: the oppression of women, the repression of sexuality, human rights abuse, child abuse, a violation of bodily integrity, harm to health, and psychological harm, to name just a few. Nevertheless, Judge Warren, chose to use one of the most common and specious frames available: cultural depravity. The main source of this frame has been the mass media, which began covering FGCs in the early 1990s. At the time anti-FGC activists were largely using the child abuse frame in their campaigns, yet journalists decided to frame the issue in terms of cultural depravity. This narrative mixed with American ethnocentrism, an obsession with fragile female sexualities, a fear of black men, and a longstanding portrayal of Africa as dark, irrational, and barbaric to make a virulent cocktail of the ‘African Other’. The more common word used to describe FGCs—mutilation—is a symbol of this discourse. It perfectly captures Judge Warren’s comment. Mutilation is, perhaps by definition, the opposite of healing and of what physicians are called to do. Defining FGCs this way allows, and even demands, that we wholly condemn the practices, take a zero tolerance stance, and refuse to entertain any other point of view. Paradoxically, this has been devastating for efforts to reduce genital cutting. People who support genital cutting typically believe that a cut body is more aesthetically pleasing. They largely find the term ‘mutilation’ confusing or offensive. They, like anyone, generally do not appreciate being told that they are barbaric, ignorant of their own bodies, or cruel to their children. The zero tolerance demand to end the practices has also failed. Neither foreigners intervening in long-practicing communities, nor top-down laws instituted by local politicians under pressured from Western governments, nor even laws against FGCs in Western countries have successfully stopped genital cutting. They have, however, alienated the very women that activists have tried to help, made women dislike or fear the authorities who may help them, and even increased the rate of FGCs by inspiring backlashes. The American conversation about FGCs has been warped by our own biases. As a Hastings Center Report summarises, those who adopt the cultural depravity frame misrepresent the practices, overstate the negative health consequences, misconstrue the reasons for the practice, silence the first-person accounts of women who have undergone cutting, and ignore indigenous anti-FCG organising. And, while it has fed into American biases about “dark” Africa and its disempowered women, the discourse of cultural depravity has actually impaired efforts to reduce rates of FGCs and the harm that they can cause.